An odourless FDA approved hand sanitiser gel. 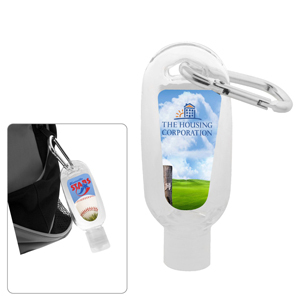 Comes in a 60ml clear plastic dispenser with a full colour digital label and a carabiner attached for easy portability. Features 62% Ethyl Alcohol, Vitamin E and Aloe Vera. Variable data available on In Stock quantities at $0.63(G) per unit. SKU:H-312. Categories: Sanitisers, Promotional Merchandise.